We’ve been singing the Harriet Tubman song for a few years now–you may have heard it sung by Holly Near with Ronnie Gilbert or by a grade school choir. It’s a particular favorite of The Platinum Singers–a compelling story of this strong woman who risked her life over and over to free more slaves. We meet at the Harriet Tubman House, and there is a large portrait of Miss Tubman in the room where we rehearse every Wednesday. 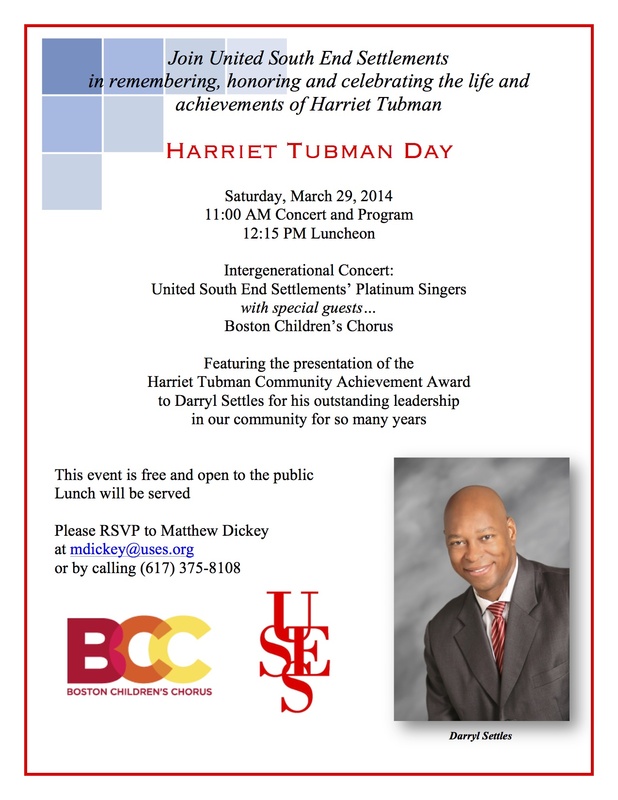 This Saturday the United South End Settlements–the facility which sponsors our Singers– is honoring a wonderful community leader, and we get to sing with some teens from the Choral Union of the Boston Children’s Chorus. We all got a lift when we met to rehearse last weekend, watching the kids do their body percussion as they sang, and working on an African folk song all together. Sometimes I write a thank you letter and hope it reaches the teacher/composer/performer. Because of one of those letters, I have a new colleague. Walter used to live around here, wrote Harriet Tubman in 1977, and has been writing more ever since. We never know who and what will be that Lifeline, but it helps to pay attention and be ready to go with it. The Platinum Singers have been Lifelines for each other and for me. Posted in Learning, Platinum SIngers and tagged as Darryl Settles, Harriet Tubman, singing, Walter Robinson.